After your first excursion into the rainforest in The Forgotten Age, you swore that you would never go back, but once you learned that your rash actions in the name of discovery had placed Arkham and the rest of the world in danger, you were left with no alternative. You bravely returned to where the trouble began to restore the proper order of time and space, and on your trek, you have been brought to a city beyond anything you could have dreamed to find. But you are not the only one seeking knowledge of what lies beyond your understanding. What will your great discovery cost you? 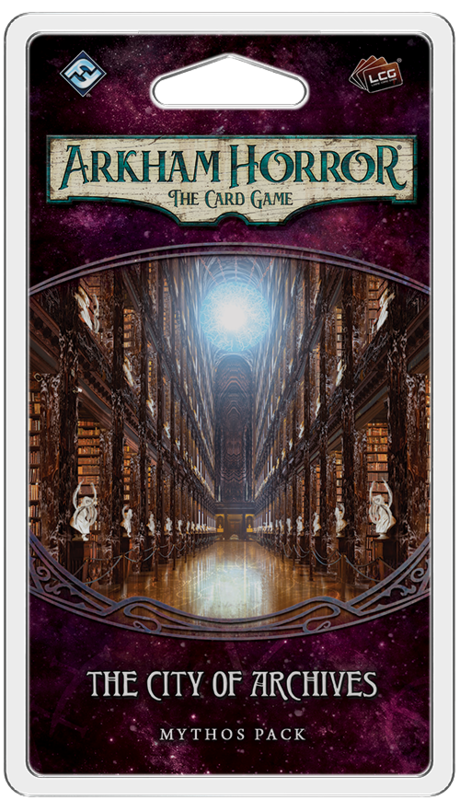 The City of Archives, the fourth Mythos Pack in The Forgotten Age cycle for Arkham Horror: The Card Game, is on sale now at your local retailer and online through Fantasy Flight Games! There are secrets hidden in every corner of this city. If you wish to discover the truth of these creatures and the greater mystery that led you here, you must learn to walk among them, but be sure that you always remember who you are. If you lose control now, the entire world will be forfeit.